Let’s get past the nostalgia, and embrace the future. 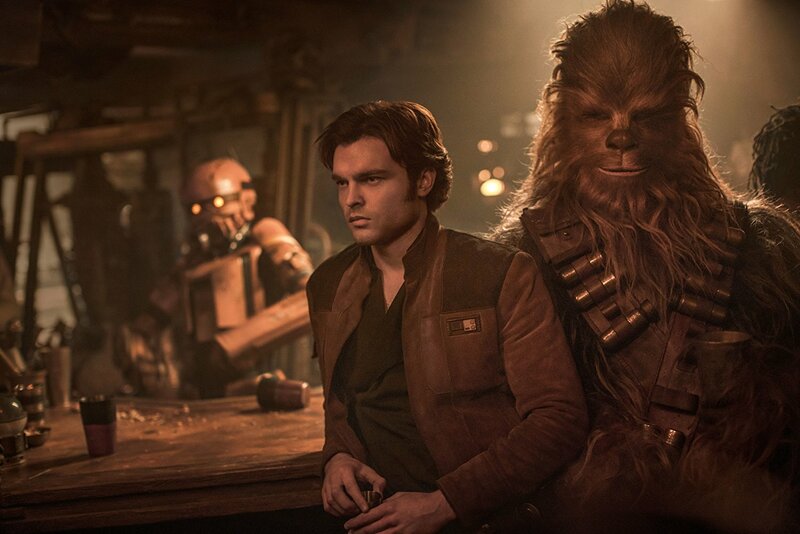 The release of SOLO: A STAR WARS STORY also marks the 41st anniversary of the theatrical release of Star Wars. The film, which would later go on to be referred to as “Episode IV” and “A New Hope,” introduced the world to Han Solo – who would arguably become one of the greatest characters in pop culture history. For forty-one years, Harrison Ford was the one and only Han. That is until today, as the actor now shares the spotlight with up-and-comer Alden Ehrenreich. Like it or leave it, Ehrenreich (who garnered attention from his performance in Hail, Ceasar!) is Han Solo. There are only a few people at the top who get to make that decision, and it isn’t us. Now let’s be clear: that doesn’t negate the performance of Harrison Ford, or any of the impact he has had on the franchise for over four decades. Yet the fact is, there is now another Han Solo. And you can choose to either embrace the decision or close yourself off to any enjoyment that it could potentially bring. The choice is yours, and you have every right to feel the way you do. But if you decide to boycott this film due to casting, the only person you are hurting is yourself. I have loved the Star Wars films since I first saw Episode IV on VHS as a kid. I own every box set from the original trilogy, all of the Blu-rays, went to see the re-releases in theaters in 1997, and have seen every theatrical release since. Needless to say, I have strong feelings when it comes to the OT. 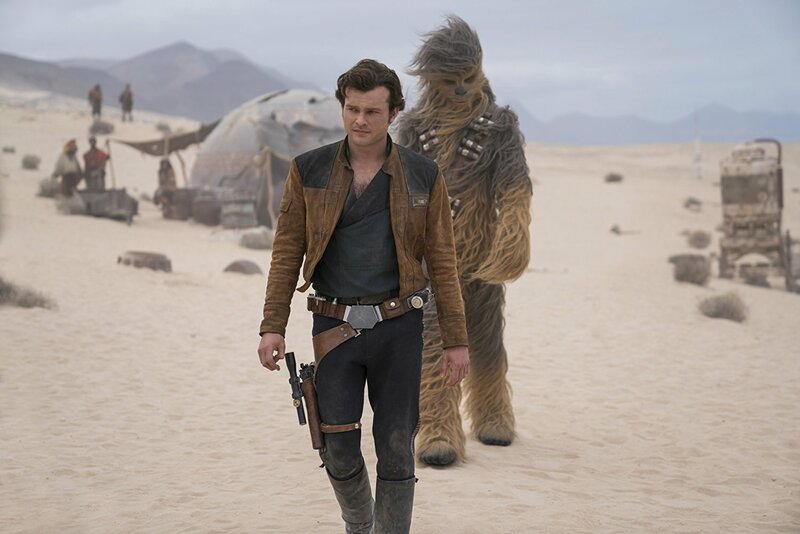 Yet I have to say, SOLO might be the most fun adventure since the first film forty-one years ago. Sure, there have been plenty of fun moments and great action in every movie since Episode IV (even in the prequels – see pod racing and Darth Maul). But as a whole, the latest film outside of Skywalker Saga (Episodes I through IX) reminds me the most of the feelings I had when I was first introduced to Star Wars. 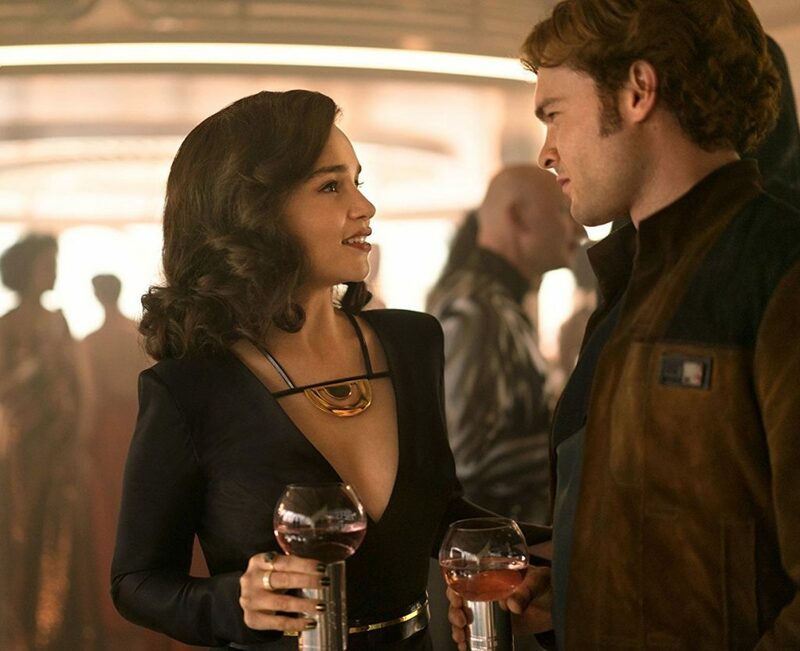 A young Han Solo (Alden Ehrenreich) and his love interest Qi’ra (Emilia Clarke) have grown up on the streets of Corellia, hustling to survive by any means necessary. Han devises a plan to escape their old life, but things go wrong and the two are separated for years. Han, an aspiring pilot, promises to return for Qi’ra and joins the Imperial Army to escape capture. Things don’t go quite as he planned, and Han is forced to join the infantry. 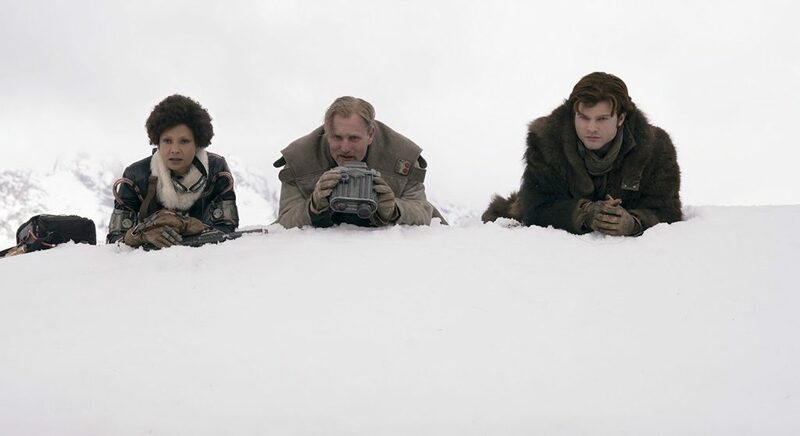 On a battleground, he meets a crew of smugglers – Beckett (Woody Harrelson), Val (Thandie Newton), and Rio Durant (Jon Favreau) – who he eventually is able to convince to let him join. 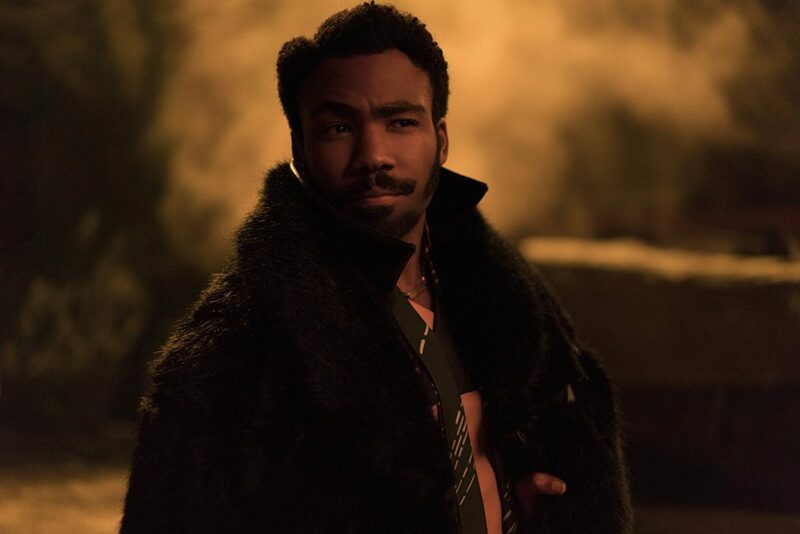 Along the way, he meets some new friends who we’ve known for years: Chewbacca (Joonas Suotamo) and Lando Calrissian (Donald Glover). Together, they are tasked with pulling off a heist that will give Han the money he needs to get a ship and return to Qi’ra. 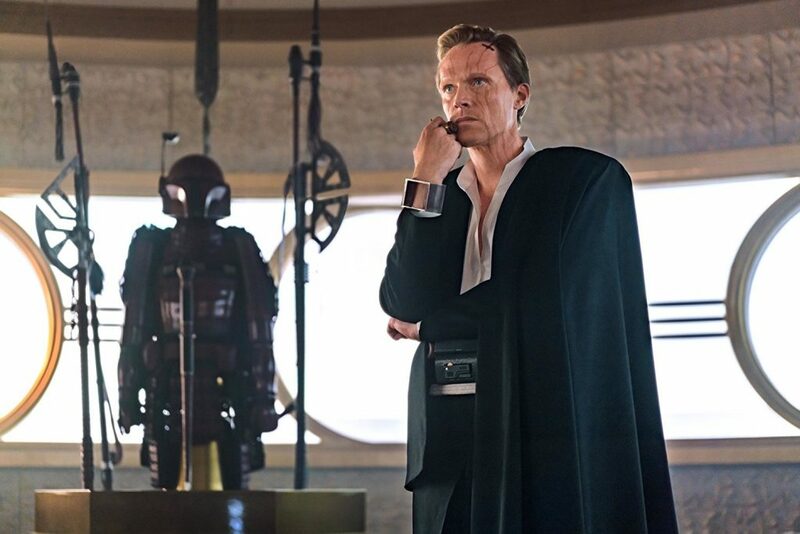 Paul Bettany plays Dryden Vos, the equivalent of a mid-level mob boss who hired Beckett to steal a valuable cargo. When things go south, Han and Beckett’s crew are forced to find a way to make things square with Vos. Bettany, who took over the role from Michael Kenneth Williams (when the film was still being directed by Chris Miller and Phil Lord) is smarmy and intimidating as the villain in the film. I wasn’t immediately sold on Alden Ehrenreich as Han Solo. I may be in the minority, but I didn’t particularly care for Hail, Ceasar! or his performance in the film. After seeing the first trailer, I didn’t think the actor looked or sounded like the character I’ve loved for most of my life. To make a long story short, Lucasfilm didn’t have an easy sell convincing me that he was going to be great. But after about fifteen or twenty minutes of adjustment, Ehrenreich’s performance sold me. I checked my nostalgia at the door, and by the time Han meets Chewie, the character just felt natural. I didn’t see it before the movie, but now I can honestly say that the casting was spot on. Ehrenreich clearly took the time to perfect his cadence and body language for the role, and I’m now actually excited to see what he does with future films. But his talent is undeniable, and it is endlessly fun to watch him overflow with Han’s not-yet-earned confidence. This is probably Emilia Clarke’s best role outside of Game of Thrones. I’m a huge fan of the HBO series, but I haven’t been given much to be impressed with outside of her fantastic portrayal of Daenerys before this. Clarke has great chemistry with Ehrenreich, and we already know that can play a character that is a force to be reckoned with. My only complaint is that we don’t get to see her hold her own in as much action as I’d like. She is more than capable in what we see however, and does get a couple of really nice scene-stealing moments. I don’t know how he does it, but the immensely talented Donald Glover is just as charming and charismatic as you would expect as Lando. He captures the spirit of the character, so perfectly established by Billy Dee Williams, and even sounds exactly like the other actor at times. All the while never seeming like he is doing an impression. He truly gets the character, and I would not be surprised if a Lando movie is announced in the not so distant future. Woody Harrelson is great as always, as a character who is somewhat of a role model for young Han. Beckett helps teach him to become the smuggler that we were first introduced to, and his influence is clearly established here. This is a good looking movie, which is no surprise with Ron Howard behind the camera and cinematographer Bradford Young (Arrival, Selma, A Most Violent Year). While the film did appear a bit dark at times (lighting, not tone), I wonder if that was the fault of my theater more than the film itself. I look forward to a second viewing to assess the darker scenes. Other than that, audiences get exactly what they would expect from an experienced craftsman like Howard. The action scenes looked great, the pacing was spot on, and the film comes together very nicely from start to finish. That is saying a lot, given the fact that a majority of the film had to be re-shot after he came on-board. At the end of the day, this is an action-packed adventure focusing on one of the main characters from the Star Wars universe whom we know and love. The movie is fun, never taking itself too seriously while handling the characters and mythology with the utmost respect. Even though we know what is going to happen down the road, the stakes feel real. And the sooner you can get on board with a new Han, the sooner you can kick back and have some real fun.